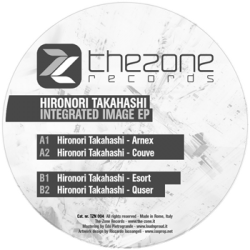 Hironori Takahashi comes straight from Japan with its sound “Dark and Deep”… these are two key words with which the Japanese signed the fifth release of The Zone Records. Already he is the producer of interesting works such as “Trianalysis EP” and “Lux Draft E.P.” on Estocastical Beats, tracks on Stroboscopic Artefacts, Panel Trax and his last track “Medu” appears in the Loco Dice’s mix-cd “Amnesia ibiza undergruond 10”. His sound was able to imagine futuristic worlds away and parallel spaces without limits or time. Technological environment and spiritual steps to dispose in our everyday lives. He calls his creations / creatures “Mental and Physical Experience”. A true therapy for body and soul… and dancefloor!! !